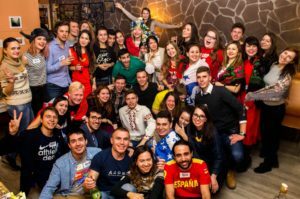 AEGEE-Moskva is mainly known in the AEGEE world for its SU “Transsiberian Dream”, but the Russian antenna held a very successfull NYE. Moreover, the new board gave us a positive feedback of their last NWM, and this local has very active members also at the European level of AEGEE. Enjoy this interview. The AEGEEan: Present your local. 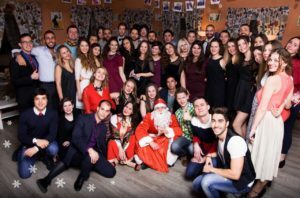 AEGEE-Moskva Board: AEGEE-Moskva is the biggest Russian local, and it was founded in 1991. Recently we celebrated the 25th anniversary of our beloved local. We have a pretty rich history and for already twenty-five years we have been offering amazing opportunities to visit Russia for members of European locals. Every year we organise a lot of different events and we are always glad to show our wonderful city and country. We have two big international events during the year. One of those is the legendary Travel Summer University “Transsiberian Dream”. During more than two weeks, 35 participants cover 6000 km through almost ¾ of all Russia. This year will be the 9th of this amazing journey. Another one is the New Year Event “Capital Cities”. We are making this event together with AEGEE-Kyiv and last winter was its 3rd edition. You recently organised your NYE event. How did it go? It was amazing! It was a mixture of braveness, craziness and AEGEE-spirit! 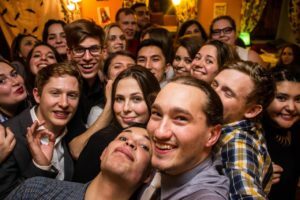 Almost a new team of organisers in Moscow and in Kyiv, awesome group of participants, some of them are really dinosaurs and for some people, it was the first AEGEE-event. The programme was not changed a lot in comparison with the previous one; it was just improved according to the feedbacks. The New Year was celebrated in Moscow with a true Russian tradition: with champagne, red caviar and “Russian” salad. We listened to the president’s speech and chime of the Kremlin. There was also Ded Moroz (Russian Santa) and Snegurochka (his grand-daughter) who gave a present to the bravest participants. In Moscow, we did ice-skating, city-tours, Tretyakov gallery quest, metro-tour, Moscow State University tour, Izmailovskiy Kremlin. Then, we crossed the border by train. In Kyiv, there were lots of different city-tours, a city-quest, II World War museum, snowboarding, Vareniki workshop and sauna. In both countries, we did language and folk dance workshops and also thematic parties. 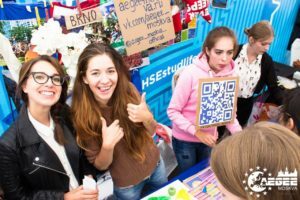 Did you attract new members in the fair for freshmen organised by your partner university? How did you manage to become more recognisable? Sure we do! Every year in autumn our partner university organises a big event in the central park of Moscow. This is an amazing youth festival which attracts thousands of students and most of our new members join the organisation because they have seen us there. Also, it is a very good opportunity to contact other students organisations and make new partners and friends. As for recognizability: first of all, we turned to a single style in social networks and Internet. This is the single style for any post and article about us and from us. That makes people understand that we represent a big organisation. Also, we increase the number of info-partners and universities where we can spread information about us and our events. Can you give us feedback about the NWM you held in December? Did you collaborate with “Your Vision for Europe” and “BEST” projects? The NWM went really great and smoothly. We could not have done it without the greatest team of organisers, their motivation and fire in their hearts. And, of course, without our beloved Netcommie, Kristina Reshetova. The participants were great, participated in all sessions and seemed to love our NWM – and that makes us really happy and proud! Yes, we collaborated with “Your Vision for Europe” project and NGO “BEST”. They provided us with wonderful sessions which were interesting and really helpful! Are you already selecting the core team of your next SU? Yes! We are doing this since 2015. It was a really great experience and it enhances the quality of our SU. Every year for our SU, the organisers of previous years choose the coordinator and core-team. And last year it brought amazing results. Transsiberian Dream took the 5th place in the rank of Summer Universities. We were extremely happy! So we are waiting for new achievements from this year’s organisers. Did you vote for a new board? Who are the board members? Tell us something about them. Our new board was elected at the beginning of November, so it is not so new. Current board-members consist of pretty old and new members of the local. Some of them joined the organisation a couple of years ago, some less than a year ago. However, all of them are very creative, motivated and full of futuristic plans. Old and new members complete each other and that helps us to make interesting ideas real. Are there any members who are active also aside from your local events? Can you tell us something about them? Yes, we have members in European bodies: Kristina Reshetova – Network Commissioner and Youth Mobility WG; Maria Smirnova – Policy Officer in Youth Mobility WG; Maria Kochkina – Audit Comission and Events Quality Assurance Commitee (E.Q.A.C); Katty Cherednichenko – Events Quality Assurance Commitee (E.Q.A.C); Anna Kuprickova – Faces of Europe (part of project “Your Vision for Europe”); Tatiana Rodina and Daria Lovkova – Editors in last Key to Europe. What are the future plans of your Local? We have a lot of crazy ideas but plans are more realistic than dreams and thoughts. So the first one is to grow more AEGEE-educated members in our local. The second one is to become a more recognisable local in AEGEE. The third one is to prepare our local and AEGEE in general for Transsiberian Dream vol. 10. Also, we are working on some other cool things! Our local gathers people from almost all parts of Russia. And this multi-nationality brings pretty interesting and crazy ideas. We are organising one of our most difficult projects and partying all nights long. We are the biggest antenna in the biggest country. Yes, we are on the side of EU and sometimes it is hard to put practice into some projects and events but our passports are full of visas. So that is why our members are everywhere.